The Greek Heritage Society of Southern California's (GHS) produced the documentary The Promise of Tomorrow: 1940-1960, the second installment in a trilogy of films documenting the Greek-Americans of Southern California. The premiere took place at the Bevery Hills, California location of the Academy of Motion Picture Arts and Sciences (Oscars®). The documentary's major corporate sponsor was Daphne's Greek Cafe, founded by George Katakalidis (Pictured below). The Greek Heritage Society of Southern California's President, Zoye Marino Fidler (pictured below) introduced the master of Ceremonies, John Aniston, aka "Victor Kiriakis" of NBC's Days of Our Lives. The documentary was narrated by Oscar Winning actress Olympia Dukakis. The Promise of Tomorrow documents the story of the Greek American experience as seen through the eyes of those who settled in Southern California. The Documentary is currently in production and will highlight the first and second generation of Greek Americans and the changing face of our community. Academy Award winner Olympia Dukakis will return to host the documentary, with additional narration by John Kapelos, as it explores the way in which the Greek American community has become an integral part of American history while maintaining a strong and unique Greek identity. Besides a cast and crew of hundreds, some notables in this wonderful production include actors Michael Constantine, Melina Kanakaridis, John Aniston and Tyler Neitzel, along with VIPs such as Jim Gianopulos, Co-Chairman of FOX Filmed Entertainment. The first part of the trilogy is called The Pioneers: 1900-1942. The Pioneers DVD is available for order here. The DVD of The Promise of Tomorrow: 1940-1960 will be out soon. 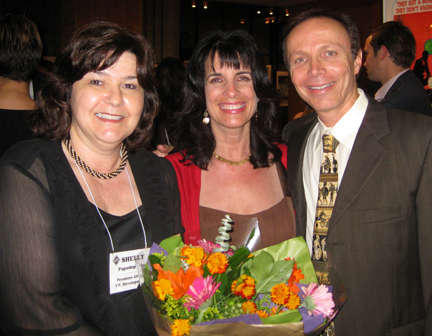 Greek Heritage Society of Southern California's (GHS) President, Zoye Marino Fidler (r) with CelebrateGreece.com's Cynthia Daddona & Dr. James Stathis. The GHS produced the documentary The Promise of Tomorrow: 1940-1960, the second installment in a trilogy of documentaries documenting the Greek-Americans of Southern California. 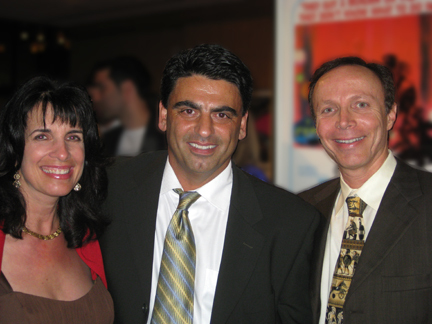 DAPHNE'S Greek Cafe CEO & Founder George Katakalidis (c) with CelebrateGreece.com's Cynthia Daddona & Dr. James Stathis. 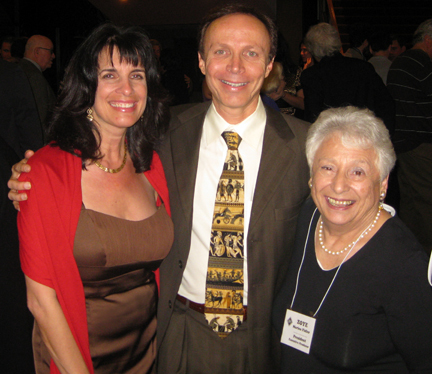 They attended the premiere of the documentary The Promise of Tomorrow: 1940-1960, the second installment in a trilogy of documentaries documenting the Greek-Americans of Southern California. The premiere was held at the Academy of Motion Picture Arts and Sciences (Oscars) in Beverly Hills. Daphne's Greek Cafe was the major donor for the documentary.